Managerial Accounting, 3rd Edition by Charles and Elizabeth Davis offers a modern, practical approach to teaching and learning managerial accounting based on a unique integration of concepts, practice, and business context within distinct and flexible learning units. 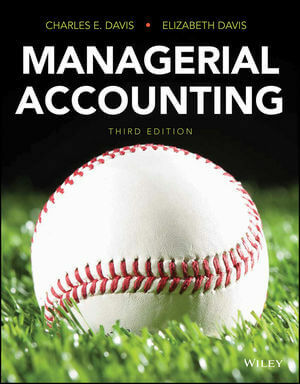 Praised for its decision-making framework, Managerial Accounting, 3rd Edition, provides students with a better understanding of decisions made by organizations through the inclusion of a Continuing CaseStory, which puts business decisions into context and allows students to see the relevance of managerial accounting to their future careers. NEW Over 70 new end-of-chapter exercise and problem solution videos using Lightboard technology, allowing students to follow along as the author solves problems on a transparent surface while facing the camera. NEWA new data analytics problem is now included in Chapters 2-11, designed to enhance students’ Excel® skills in manipulating and interpreting data. Manageable units of content keep students engaged with an accessible conversational style. Practice questions and exercises follow each unit, giving students frequent opportunities to interact with managerial accounting topics throughout the text. An extensive amount of comprehensive homework, exercises, problems, and cases for all units are provided at the end of each chapter, and all are assignable in WileyPLUS. ORION adaptive practice that helps students build their proficiency on topics and use their study time most effectively. Current users and reviewers alike value the quantity and quality of practice questions and end of chapter problems available in the Davis, Managerial Accounting program. These give instructors and students plenty of opportunity for practice and learning outcomes assessment both in the book and online in WileyPLUS.